The unavoidable fact about the current the Fed zero interest rate policy is that it has not spurred aggressive business investment or consumer borrowing that historically investors expect from accommodative Fed policy. Several factors explain the difference, including a curtailment in fiscal spending growth and a much more restrictive bank regulatory environment. In the wake of the 2008 financial crisis the Bernanke Fed was task by Congressional law (Dodd Frank Act) to use a “macro-prudential approach” (a.k.a. capital controls) to handle threats to financial instability. (Ben Bernanke Blog - Should monetary policy take into account risks to financialstability?) The result has been a more bureaucratic deployment of capital in the U.S. economy, rather than allowing the free market to allocate capital based on interest rate levels and reserve requirements at financial institutions. Much of the effort has been done with a stated Obama administration goal of keeping the cost of financing the U.S. National Debt low. Since the end of 2008, the combination of ZIRP augmented by tight regulations on what banks can and cannot do, has empirically resulted in hoarding of cash reserves by a few large financial players in the financial system. (See Excess Reserves of Depository Institutions). Investors looking for inflation from the low interest rate policy have been silenced by the actual result. The reality from an implementation standpoint is that current Fed policy is a restrictive rather than "accommodating" monetary policy. This perspective is now supported by real economic data with respect to the actual impact on the average consumer and small businesses since early 2009. The low rates have not translated to lower rates on consumer or credit card loans; but, the lower rates have translated to lower rates (0%) on consumer savings. Additionally, lower rates have not translated to substantially lower rates or an expansion of small business loans. In other words, spreads on Wall Street have expanded or been preserved, and Washington has benefited through lower financing costs on the National Debt. But the majority of the population has experienced a more restrictive policy (net of a few who may have gained by lower mortgage financing rates, if they could actually get a loan approval). Arguments about a "wealth effect" because of stock market gains again only apply to a small segment of the population. What is the Biggest Risk to Financial Stability Now? The artificial market equilibrium shift lower in rates caused by QE has not lead to corresponding sustained level of business investment growth. As a result, the U.S. financial market now sits on a very weak foundation which can crumble simply by a reversal of the Fed balance sheet. 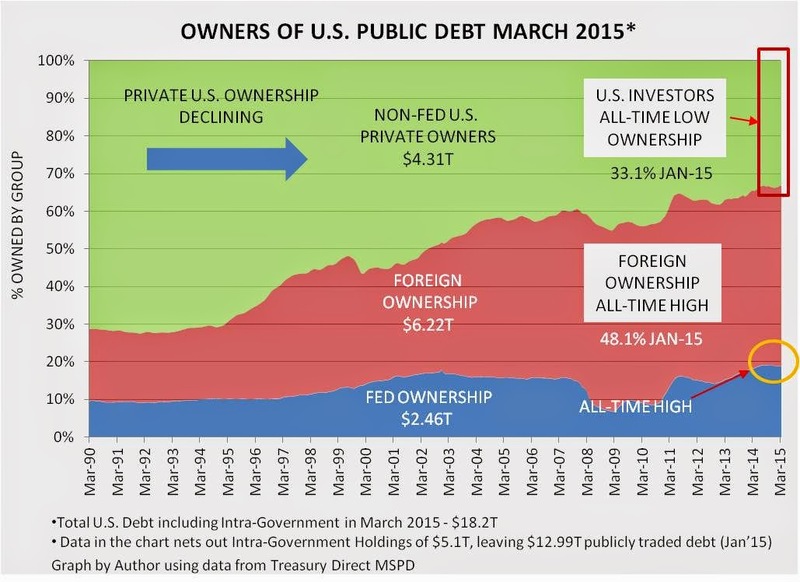 As the above graph visually demonstrates, the biggest financial threat to financial stability may well be the liability side of the U.S. balance sheet – of which the Fed has become a much larger owner recently. Foreign holdings have increased in percentage terms to all-time highs recently (the foreign balances include both government and multi-national company holdings in overseas custodial accounts). Ironically, QE was implemented under the pretense of solving a financial instability problem in 2008 and expanded in 2013 to solve an unemployment problem. Does the Fed have a “macro-prudential” policy to protect the market from the financial instability which its own balance sheet is masking should a change in the flow of funds into U.S. Treasuries happen now? Fed actions which lead to an erosion of the purchasing power of U.S. consumer savings are restrictive, not expansionary monetary policy when capital controls are implemented which restrict monetary expansion across a large cross-section of the U.S. economy. This is the policy U.S. investors have lived with for the past 6 ½ years. It equates to "taxing the masses," which cynically may be the point since no elected official wants the responsibility. Returning rates for U.S. consumers to money purchasing power equilibrium matching the U.S. inflation rate, rather than trying to advantage certain groups over the mass market through Fed “macro-prudential” policy seems, in my one vote opinion, to be a sounder policy framework. In fact, it is probably much more likely to produce sustainable U.S. employment growth. 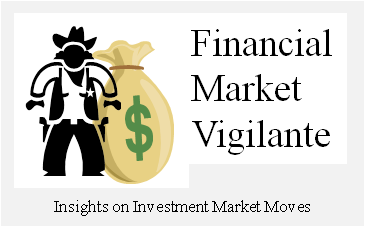 What is the best course of action for your portfolio in the current skewed financial environment? My opinion is that steady re-balancing of your portfolio is the best “macro-prudential” approach at the present time because as I have pointed out in previous posts, U.S. equity markets are expensive. The goal in re-balancing should be to create higher and higher liquid, cash equivalent balances prior to the point in time the Fed decides to change its policy based on its interpretation of economic factors, or more likely because it is forced to because political circumstances change. Investors can hedge this outcome risk by selling (preferably into rallies) small percentages of the over-priced equities or U.S. broad indexes (DIA) (SPY) (QQQ), creating higher cash balances and moving a fraction of the proceeds into sectors that have suffered large declines in the wake of the current Fed policy. These beaten up sectors all have a common theme –Emerging Market Equity and Debt, Commodities, Oil and Gold.